People like to segment youth into easy stereotypes, but kids know better. Big 30 is a positive and upbeat look at the ways American youth has changed and the landmark experiences that haven’t. Creative Direction: Doug Lloyd Art Direction & Design: John Wolfington Fashion Director: Debbi Mason Fashion Editor: Arabella Mills Contributors: Mario Sorrenti, Terry Richardson, Mikako, James Christopher Kendi, Cheryl Dunn, Rebecca Pierce, Justine Kurland, Roe Etheridge, Stefan Ruiz, Carter Smith, Catherine Servel, Alejandro Cardenas, Jan Willhem Dikkers, John Vertin. COL; paperback. 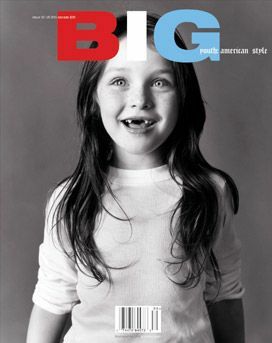 Publisher: Big Magazine, New York, .